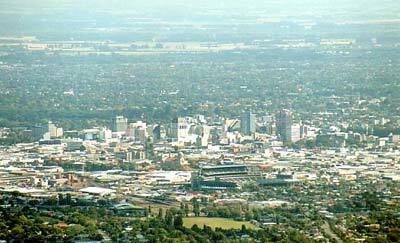 Christchurch is the New Zealand South Island's largest city. The city is named after the cathedral college of Christ Church in the University of Oxford. Its Maori name is Otautahi, from the Maori chief Tautahi who had a settlement on the banks of the Avon River. In the east coas, Christchurch is perfect as a pleasant jumping-off point for the mountains, ocean beaches, rivers, lakes and wide-open spaces less than an hour from the city centre. The city is set in an archetypal New Zealand setting of rural sheep-strewn fields stretching towards rugged alpine mountains. Over 150 years ago, Christchurch was planned as the perfect High Anglican town. 1000 AD: Archeological evidence found in a cave at Redcliffs indicates that the Christchurch area was first settled by moa-hunting tribes. Maori oral history tells that humans began living in the area. Between 1500 and 1700, the Ngati Mamoe from the Napier region, and, later, the Ngai Tahu tribes from the North Island, travelled south and became dominant, either by conquest or intermarriage. By 1800 the Ngai Tahu controlled the coast, with a fortified village (or pa) at Kaiapoi. This was also a major trading centre for greenstone, which was collected over the Alps on the west coast. 1830: There were European settlers, notably the Deans at Riccarton, what are regarded as the First Four Ships were chartered by the Canterbury Association, and arrived on December 16, 1850 bringing the first English settlers to Lyttelton Harbour. The four ships were Randolph, Charlotte Jane, Sir George Seymour, and Cressy. The vast holdings of the tribe were a compelling attraction to colonisers, and throughout the 1840s and 1850s numerous land transactions were carried out. However, from the outset Crown officials failed to uphold their promises in relation to a number of agreements. Kemp's purchase of 1848, which secured 8000 hectares (20,000 acres) of Ngai Tahu land, including Christchurch City, was never settled properly and formed the basis for the Ngai Tahu claim that was finally settled in 1999 under the Ngai Tahu Settlement Act. 1849: Captain Thomas, the Canterbury Association's Chief Surveyor surveyed the surrounding area. By December he had commissioned the construction of a road from Port Cooper, later called Lyttelton, to Christchurch via Sumner. Goods that were too heavy or bulky to be transported by pack horse over the Bridle Path were shipped by small sailing vessels some eight miles by water around the coast and up the estuary to Ferrymead. 1863: New Zealand's first public railway line was opened from Ferrymead to Christchurch. Due to the difficulties in travelling over the Port Hills and the dangers associated with shipping navigating the Sumner bar, a railway tunnel was bored through the Port Hills to Lyttelton, opening in 1867. Christchurch became a city by Royal Charter on July 31, 1856, making it the oldest city in New Zealand. Many of the city's fine Gothic buildings by the architect Benjamin Mountfort date from this period. While development in the North Island languished in the late-19th century because of the Land Wars, conflict between the colonial government and the Maori, the South Island prospered, helped first by farming and then by the discovery of gold. 1870: The North's economy began to recover, but it remained the poorer cousin to the South Island well into the 20th century. 1906-7: Christchurch's golden moment was at the great International Exhibition. This event attracted nearly two million visitors, at a time when the total population of the country was less than half that, and put on show almost every aspect of the colony's life, from agricultural products to machinery, the visual arts to music. The emergence of Auckland as an international player and the establishment of Wellington as the nation's capital saw Christchurch settle into an affluent, confident small city role. The Anglican establishment has remained visible, but subsequent waves of migrants has meant that it is emblematic rather than actual. Christchurch is successfully managing the shift from a rural to a knowledge-based economy, and is well-known for its educational institutions. 1960: A road tunnel was constructed between Lyttelton and Christchurch. 1974: Christchurch was host to the Commonwealth Games.